Uses: Homex 300 has been used successfully in many installations from those measured in feet to those measured in feet to those measured in miles. Homex 300 may be used as a light duty forming material in such applications as walkways, patios, pool aprons, driveways and more. Homex may also be used as an expansion joint where masonry or concrete walls meet outside approns, walks patios or steps. Homex 300 has been time tested in numerous applications throughout the United States and Canada. It is compatible with sealants where their use is required. The basic material in Homex 300 is 100% post consumer wastepaper (with weather and termite resistant additives) which is homogeneously formed into conveniently handled panels. Homex 300 is light weight, splinter free and easy to cut or shopae. It is available in 1/4", 1/2", 3/4" and 1" thickness, lights to 10' and width from 3" to 48" (custom sizes available upon request). 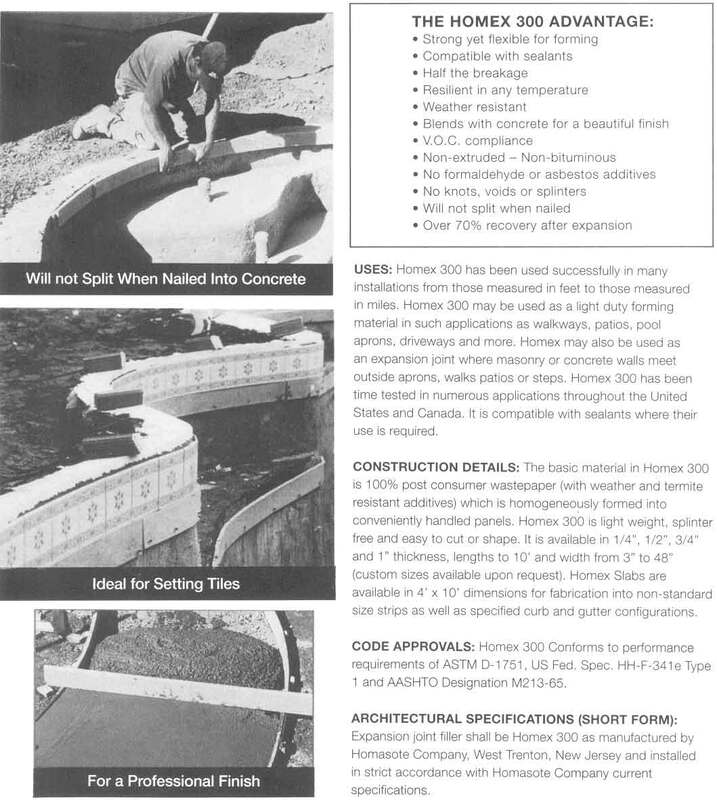 Homex Slabs are available in 4' X 10' dimensions for fabrication into non-standard size strips as well as specified curb and gutter configurations.